We know earthquake forces shake building foundation back-forth which is finally resisted by inertia forces produced throughout a structure. The vertical inertia forces are ignored as buildings are usually designed for vertical static loading. Vertical forces may critical when building is located very close to point of fault rupture. Now the ground acceleration transmitted to structure through foundation. But does full ground acceleration is passed through foundation? Actually the both acceleration are never found same, as building structure is not rigid i.e. the structure and its foundation are not rigid. If the rigidity criteria is satisfied both would have same acceleration i.e. Newton’s Law (F=M X A) is Valid. All structures have flexibility to some extent. When a structure suffers less deformation (i.e. it absorb some energy), the inertia force would be less than MXA (product of mass and ground acceleration). When a structure is very flexible (has natural period/frequency near ground waves), it would be subjected to more force than MA under repeated ground motions. Thus we have learnt that lateral force acting on a structure not only depend on acceleration of ground motion but also type of building structure i.e. response of the building and foundation too. 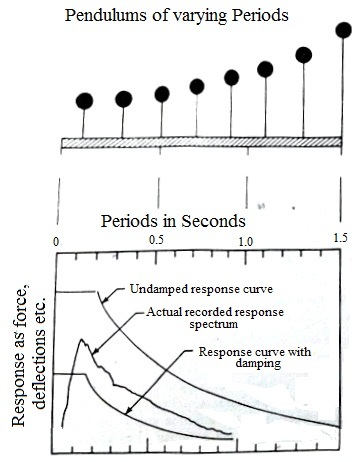 The relationship between structure and ground acceleration is expressed as response spectrum. To understand response spectrum let us consider oscillators of different periods. Oscillators of cantilever pendulums of different heights are taken which are mounted from a base that can be shaken back-forth (cyclic motion) to simulate seismic waves recorded in previous earthquakes (probable earthquake to be happened). Here buildings are represented by these oscillators. For simplification single degree of freedom is considered and various periods represent for different structural type. Under cyclic motion maximum response Vs natural period of vibration is plotted as shown in above figure. Again every structural system contains inherently its damping mechanisms. This damping obviously reduce large amount of response especially when repetitive motion continues. Now we made an assumption to consider actual building as oscillator. The response curve found in this way can be applied depending on how nearly behavior of these simple oscillators represents complex behavior of a building. The response spectrum is the simple way to determine maximum response under seismic ground motion. The uniform building code provides us to use seismic co-efficient that responds nearly in shape to response spectra produced from some/probable earthquake and also reflects the consideration of having longer period of taller building (as taller pendulum) and shorter period for short building. Thus shorter and stiffer building will be subjected to greater inertia forces than taller building.